This edited volume focuses on India's experiences waging counterinsurgency campaigns since its independence in 1947. Filling a clear gap in the literature, the book traces and assess the origins, evolution and current state of India's counterinsurgency strategies and capabilities, focusing on key counterinsurgency campaigns waged by India within and outside its territory. It also analyzes the development of Indian doctrine on counterinsurgency, and locates this within the overall ebb and flow of India's defense and security policies. The central argument is that counterinsurgency has been an integral part of India's overall security policy and can thereby impart much to political and military leaders in other states. Since its emergence from British colonialism, India's defence policies have not merely sought to protect and preserve India's inherited colonial borders from threats by rival states, but have also sought to prevent and suppress secessionist movements. In countering insurgencies, the Indian state has fashioned strategies that seek to repress militarily any secessionist movement, while simultaneously forging a range of civilian administrative and institutional arrangements that attempt to address the grievances of disaffected populations. The book highlights key strategic and tactical innovations that the Indian Army and security forces made to deal with a range of insurgent movements. Simultaneously, it also examines how the civilian-military nexus enabled India's policy makers to utilize existing, and formulate novel, institutional means to address extant political grievances. India has been most successful where it has managed to use calibrated force, obtained the trust of much of the aggrieved population and made persuasive commitments to political and institutional reform. 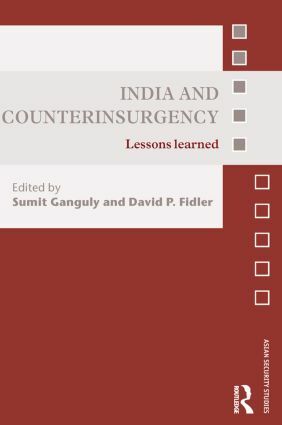 Examination of these elements of India's counterinsurgency performance can be compared to counterinsurgency doctrine developed by other countries, including the United States, and thus yield comparative policy prescriptions and recommendations that can be applied to other counterinsurgency contexts. This book will be of great interest to students of counterinsurgency and irregular warfare, Indian politics, Asian Security Studies and Strategic Studies in general.